Update: January 2015: Click here for document from Dave Stoner regarding economic development in Crozet and Click here for email that accompanied document from Dave Stoner. 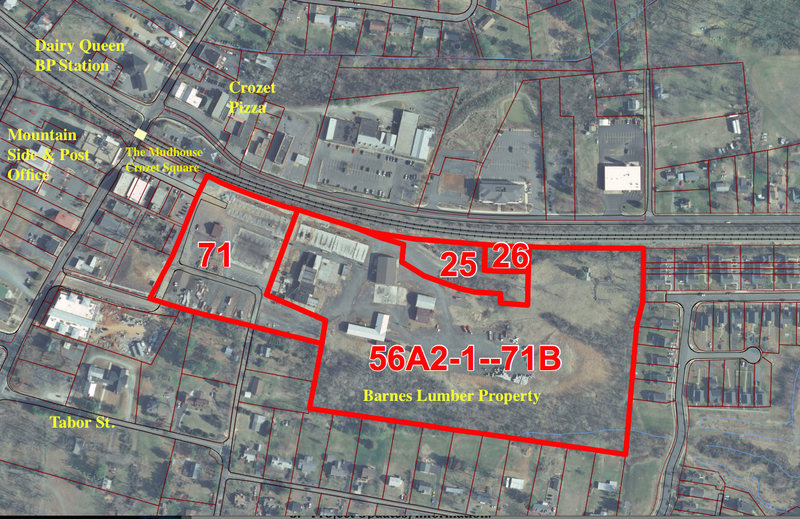 Update: August 5, 2014: The Albemarle County Planning Commission granted developer Frank Stone's application to rezone the Barnes Lumber property in downtown Crozet and "indefinite deferral". This is the second time this property's re-zoning has been granted an indefinite deferral. Further information about this deferral at the Crozet Gazette and Cville Tomorrow websites. The Crozet Community Advisory Council heard Mr. Stoner's proposal at their December 2013 meeting. The Crozet Gazette covered it and published its story about that meeting (Click here to read it.) The minutes of the December 2013 CCAC meeting are also available here. The County staff reviewed his proposals and on February 26, 2014 issued a 15 page comment, the PDF of this is available here. An important question to consider is how well this plan adheres to the Crozet Master Plan. In mid-May 2014, Mr. Stoner, emailed the following update to Ann Mallek, our White Hall district supervisor to share with the Crozet Community Advisory Council (CCAC) as he prepares to go before the Planning Commission on Tuesady, June 17, 2014 at 6:00 PM. As of this posting, the Planning Commission agenda for June 17, 2014 has not been posted, however you can get it when it is by clicking here. For the sake of comparison – here are two drawings from the last proposal for re-developing the Barnes Lumber property that was submitted by the Piedmont Development Group back in August 2010 and February 2011. The current proposal is actually a continuation of that request for re-zoning (ZMA2010-0018). Here's what the Piedmont Development Group's proposal for Barnes Property looked like in February 2011. Below (click on Continue reading) is Frank Stoner's May 16, 2014 email, followed by links to the documents he references in the email below. Attached are the latest responses we submitted to the County. I’ve also included the authorization letter from CSX regarding their property. I had a meeting with staff shortly before our resubmittal, suggesting that we try to get as many issues off the table as possible, face to face, instead of through extended submittal/response cycles that eat up a bunch of time and often don’t lead to real solutions. As you know, time is of the essence for us as the September 30 drop dead date looms with the Bank. Stormwater – Glenn asked for and we delivered a narrative and a chart showing the types of storm water measures that we plan to use within the development blocks. Transportation – Troy suggested, and we have included, a mini-roundabout at the end of the square. He was pushing for removal of the intersection until I suggested that removing it would only drive more traffic to the square and that’s what he says he doesn’t want. The traffic study we submitted seems to indicate that signals may eventually be needed at Jarmans Gap, Library Avenue and the Square. Vdot may only permit 2 of these intersections to be signalized but they don’t know which 2. We have not proffered funds toward another light because I’d rather spend that money on the plaza/park or a connection under the railroad. My sense is that VDOT can come up with the money for one more signal but I know they are not going to fund anything in the Plaza or park. I’d welcome your thoughts on this. Open/Civic space – we’ve modified our application to provide some assurance that all the open space won’t end up in the stream buffer and around residential units. At least ene third of the open/civic space will be located in blocks 1-5. If we can get Carroll’s property, that percentage will increase further. Affordable Housing – We’ve proffered to build 15% affordable housing on the entire rezoned site, not just the area subject to the SUP. However, we think most of those units will be flats, apartments or condo’s and, as such, have phased the affordable such that full compliance is not required until some multifamily gets built. Some may happen in blocks 6-7 and 8 but we’ve included blocks 5 and 6 just to be safe. Phasing – We’ve clarified the phasing of the project. There is both commercial and residential in phase 1. Demand will drive the pace of commercial development. I’ve been working closely with Susan and have met with a number of local businesses that might have an interest in relocating to Crozet. I have 1 viable prospect now and I’m confident that, if we can get a little momentum, more will follow. Residential is critical in the early phases because it provides the rooftops to support local retail and the demand is more predictable so it helps us secure the funding necessary to build the road. Special Use Permit – We strongly believe that our SUP is in conformance with the goals and intent of the original Crozet Master Plan . Our SUP provides a critical residential buffer area and a more logical transect from low density residential to downtown commercial. This transect existed in the original master plan from the consultants but was modified during the development of the DCD district. It provides needed variety of housing options within walking distance to downtown and adaptability so that, as downtown grows over the next 20 years, ground floor residential can be easily converted to commercial if there is a need. Cash Proffers – I don’t need to say much here. We’re going to build a $2MM road. No other DCD zoned property has paid cash proffers. We’re building 130,000 sf of commercial that must be affordable for downtown to work. Etc. Etc. I think it’s important for people to realize that this rezoning is not the end of process that will determine the fate of downtown. It’s the very beginning. This is just a land use decision, not a design or program for downtown. The heavy lifting is ahead and we’ll need real engagement from the entire community to define the identity of downtown, improve access, determine how the public areas will be programmed, built and maintained, develop and fund a long term parking plan, and recruit the kinds of businesses to Crozet that residents want and need. I hope the focus of debate can soon shift so that we can begin to work more collaboratively on these issues because we can’t solve them without the full engagement of the community and the County. Thanks again for all your support. I’d welcome your thoughts and advise as we begin to prepare for the PC meeting next month. 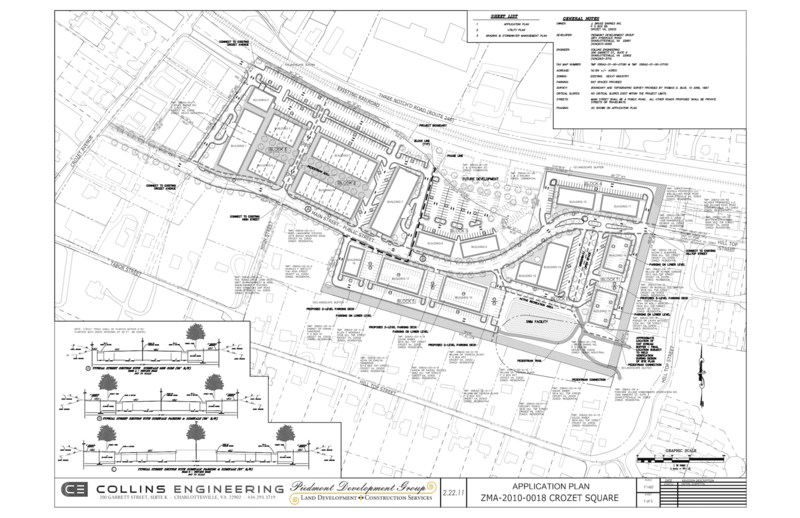 Albemarle County staff report on Barnes Lumber/Crozet Square redevelopment proposal. To be presented at the Albemarle County Planning Commission meeting on Tuesday, June 17 at 6:00 PM. The staff reports, such as from Ms. Claudette Grant are their names name as a document download. And after you're done reviewing or downloading those documents, return to step 4 above and enter: ZMA201000018 Which is the Zoning Text admenment, as he has submittted requests under this as recently as April 16, 2014. Welcome by Tim Tolson, President. In remembrance of 9/11 and in honor and memory of all first responders, Tim read a brief reflection of the happening of 9/11 and had a moment of silence. 29 people were in attendance. Approval of the CCA’s last meeting's minutes (May 8, 2014): Jim Crosby made the motion to accept the minutes and Lisa Goehler seconded. The minutes were approved as presented. Treasurer's Report by Emery Taylor: He reported a balance of $3,310.12. Captain Greg Jenkins spoke about the Batesville community meeting. He has cautioned the Crozet citizens to be aware of vandalism and burglaries and report their concerns as quickly as possible. Keep our cars and houses locked. Information about Ambulance billing and EMS Cost Recovery in Albemarle County (Kostas Albertis, WARS) http://www.albemarle.org/emscostrecovery. They were unable to attend the meeting. Update on Crozet Avenue Streetscape project and Crozet Safe Routes to School Sidewalk project (Albemarle County staffers Trevor Henry, Director of Facilities Development and Jack Kelsey, Transportation Engineer). Trevor and Jack spoke on the completion of the project and how soon it will be over. Actually the project is coming with some funds left over. Many questions were asked about why certain things have happened during the progress of the project. With as many different obstacles in traffic flow, there is no textbook way to do this project and it takes creativity and ingenuity to complete the project. Some parts of the project the citizens may not understand until after the project is completed. Trevor and Jack answered questions on Rte. 250 by Harris Teeter. This area has raised concerns due to fatal accidents that have occurred in that area. Consultants have been hired to begin many recommendations to the area. Updates and News from Ann Mallek, our county supervisor. Ann spoke on the Heritage House Festival, Crozet Tunnel Book ($20), connecting trails (many almost complete), strategic planning with School Board, CIP (begins in November), tourist information center in basement of library, two county employees for seeking commercial businesses in the county instead of one, costs dealing with VDOT and planning with VDOT. One major issue is farms and wineries are opening their doors to tours and the county needs to be sure that public is being protected in all safety issues. Updates about Claudius Crozet Park (Kim Guenther, Crozet Park President) Kim explained that the big Third Annual Culinary Event at The Lodge at Old Trails on September 18 is to benefit the park. These funds collected will go towards the project of the amphitheater that the citizens’ survey suggested. This coming Wednesday, United Way "Day of Caring" volunteers will paint the fence on the boundaries of the park. New pavilion is being erected and many thanks to a very large donation. The park is for everyone's and all Crozet citizens should take an active part in keeping the park, maintaining it, and attending events held there to benefit the park. Update on the Build Crozet Library fundraising (http://buildcrozetlibrary.org). Tim read a note from Bill Schrader thanking us for the Good Neighbor Award. The library usage is exceeding expectations and the library has won recognition in a national library magazine for the extra hours open for students to study for exams. 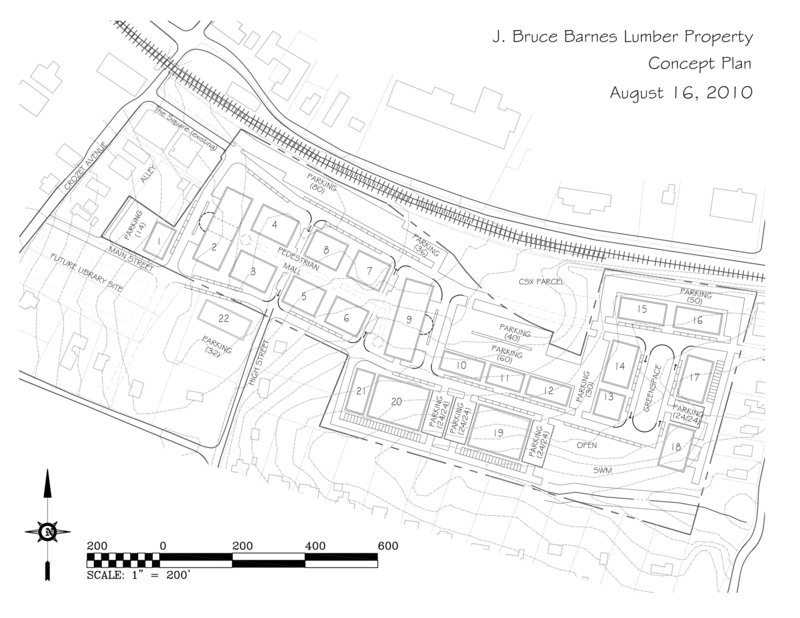 Update on Barnes Lumber re-development proposal by Frank Stoner/Milestone Partners? http://www.barnes-lumber.com The proposal is on hold right now. Recap of Fourth annual Crozet Independence Day Celebration. Next year's on Saturday, July 4, 2015! Tim explained the success of the event and how many citizens attended the event. Many expressed how nice the fireworks were. We can expect a possible increase in cost of fireworks due to the event occurring on July 4th in 2015. Replacing stolen "Welcome to Crozet" sign near RWSA treatment plant on Rte. 240 (Three Notch'd Road). A new sign should be purchased to replace the stolen one. Mike Marshall motioned to replace the sign and Phil Best seconded. Motion is tabled until next meeting, per the current bylaws. Tim will proceed with arranging work with Peter Welch, Legacy Signs, originally did the signs. Discussion about amending the bylaws. We should also amend Article VI, which states: Changes to these bylaws may be made by majority vote of attendees at a scheduled CCA meeting. Article VI seems to be in conflict with Article VII. The consensus of those present at the meeting is that we want these two articles to allow the CCA to conduct general and usual business, such as replacing signs, buying Crozet stickers, etc. at one meeting without having such motions waiting months to pass. However, other items and issues that result in a motion should have to carry over to the next meeting, so that a few people cannot force an issue through the CCA. This was the original intent of Article VII being added. Jim Crosby made the suggestion that we also state in the bylaws what constitutes a quorum of the CCA and how our meetings will be governed (e.g., by Roberts Rules of Order). Jo Ann made a motion that the Bylaws be revised to allow CCA to conduct general business at one meeting and to revise Articles VI and VII to reflect this as well as add articles about what constitutes a quorum and using Robert's Rules of Order to govern the meetings. Mike Marshall seconded the motion, saying that the bylaws be amended as discussed. The motion is held for a vote at our next meeting per our current bylaws. Tim asked for a motion to reimburse him for the cost of these stickers. Jo Ann Perkins moved that Tim be reimbursed for the cost of the Crozet stickers and magnetic stickers. Mike Marshall seconded. Per our bylaws, motion is held for a vote until the next meeting. Crozet Community Advisory Council meeting is next Wednesday, September 17 at 7:00 PM at the Crozet Library. NOTE the new day of the week (Third Wednesday) and location (Crozet Library). Everyone is encouraged to attend. Crozet Arts and Crafts Festival, Saturday & Sunday, October 11 & 12. They need your help to make it a success. Plan to attend and bring your co-workers and friends! Crozet Trails Crew (CTC) 5K run on October 11, 8:30 AM at Crozet Park. Field School’s Crozet Ghost Walk: The Field School Fund Raiser is October 17 and 18. Plan to attend for quite an evening in Crozet. Look for advertisements. Mountainside’s Culinary Experience and Quilt Auction: November 1 is the time of this event to benefit activities at Mountainside for their residents. Mike Marshall introduced Rich Pleasants: He is planning a manufacturing plant in Crozet. Nice article about his plans are in September Gazette. Tim offered congratulations and praise to Mike Marshall, editor of the Crozet Gazette, on its 100 issue! What would Crozet do without your news? We are very appreciative of all Mike and the paper do for the good of the community. Jo Ann Z. Perkins, CCA Secretary, prepared these minutes. RECOVERED: The ACPD recovered the "Welcome to Crozet" sign that was stolen from near RWSA treatment plant on Rte 240 (Three Notch'd Road) (thank you!) However, not before we had already replaced it. Motion was made by Jo Ann Perkins and seconded by Mike Marshall at our last meeting to reimburse me $375 for purchase of magnetic Crozet emblems (as invoiced). Per our bylaws, it was tabled. Is there a motion to resume consideration? Motions to amend the bylaws or regarding larger community issues, (e.g,. to support the Crozet Master Plan) may be approved at one meeting, but then must wait for a vote to adopt at the next scheduled CCA meeting. So such a motion, after the first meeting may be said to be "approved, but not yet adopted". Election of CCA officers occurs at our next meeting, January 8, 2015. Nominations are open for President, Vice President, Secretary, and Treasurer. Current officers are: President: Tim Tolson, Vice-President: Lisa Goehler, Secretary: Jo Ann Perkins, and Treasurer: Emery Taylor. Candidates must be present at the January 8 meeting or have spoken with a current officer about their willingness to serve if elected. Revision of Article II concerning when elections are held. Currently the second sentence says: Majority approval by attendees at the final meeting of the calendar year will constitute election. However, our practice for many years has been to hold elections on the first meeting of the year. Suggest it be revised (bolded italics indicates revision, otherwise it as currently worded) to say: Article II: Officers will be elected for a one-year term, commencing on the first meeting of the calendar year immediately following their election. Positions will consist of President, Vice President, Secretary, and Treasurer. Candidates must be present at the election or have spoken with a current officer about their willingness to serve if elected. Majority approval by attendees at the first meeting of the calendar year will constitute election. Duties of the officers shall be as implied by their titles. All officers shall be responsible for keeping accurate records. The Crozet Community Association meeting will begin with a special presentation, entitled Clann Mhor and the Blue Ridge Tunnel Restoration. by Clann Mhór Dan Burke and Kevin Donleavy along with Bob Dombrowe, about the Crozet Tunnel, the people who build it in the 1850's and its current restoration. The implementation phase is now underway for Phase I of the Blue Ridge Tunnel Project. Nelson County officials have selected and awarded the contract for Phase I of the rehabilitation and trail project to Fielder’s Choice Enterprises, Inc. of Charlottesville, Virginia. Work began October, 2014 and is scheduled to be completed by February 2015. Clann Mhór is a small non-profit, tax exempt 501.c.3 research organization that is studying the history of the Blue Ridge Railroad in Central Virginia. During the 18 50's this seventeen-mile section of the railroad was built under the direction of Claudius Crozet, a brilliant French engineer, who took on the challenge of getting the railroad over the Blue Ridge Mountains. The contractors for this work hired hundreds of Irish immigrants and rented slaves to do this difficult work. Clann Mhór – which in Gaelic means the Great Family – wishes to honor the history of these forgotten railroad workers. Full Disclosure: This presentation is part of our usual Crozet Community Association meeting. All are welcome, even encouraged, to attend. Our meeting agenda is available by clicking here.